Conservative in terms of art and traditional values, progressive regarding facilities like transportation, accommodation and communication, Cochin is truly a traveller's paradise. Its natural charm supplemented by friendly people is sure to make your visit a special experience. The city is also blessed with one of the finest natural harbors in the world. Popularly referred to as the Queen of the Arabian Sea, Cochin is located on the west coast of India in the beautiful state of Kerala. The city can be regarded as the commercial and industrial capital of Kerala. The city extends from latitude 9°58' in the North to longitude 76°17' in the East. Being situated very close to the sea, Kochi has a moderate climate, with heavy rains during JuneAugust due to the southwest monsoon. Winter starts from December and continues till February. In summer, the temperature rises to a maximum of 35°C and 25°C in the winters. Annual average rainfall is 310 cm. Though Cochin had been an important roadstead in days gone by, it became a natural harbour only when nature decreed it so. Muziris (present-day Kodungalloor on the mouth of the Periyar River), 40 km north of Cochin, was the center of trade with ancient Rome in the products like pepper and pearls, fine silks, cotton, muslin, honey, oil, betel, tortoise shell, cinnamon leaf, black pepper, ginger grass, and indigo. 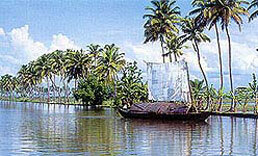 The formation of Cochin harbor has a violent story of which nature herself was the main character. The harbour was formed in a.d. 1341, when a great flood in the Periyar River led to an outlet in the sea. The floods had meanwhile silted up the mouth of the Muziris harbor and this rich ancient port was banished to the footnotes of history. Meanwhile, the merchants of Muziris shifted to Cochin. For centuries, Cochin was the battleground of European powers for the mastery of the lucrative trade of the Indian west coast. The fortunes of political powers in Cochin were dictated by pepper. The Portuguese were the first to come in. Two years later, the adventurous mariner, the legendary Vasco da Gama himself landed in Cochin. The Portuguese erected a fort for the protection of their factory. Fort Manuel, or Manuel Kotta, named after the King of Portugal, was the first fortress constructed by the Europeans in India. To the Portuguese must go the credit for the extensive scientific cultivation of coconut, ginger, and pepper, backbone of Keralas economy today. Tobacco, cashew nut, and fruit cultivation were also introduced. The pineapple, for instance, is still called prithichakka in Malayalam, meaning Portuguese jackfruit. They were also responsible for todays burgeoning trade in coir. The Dutch, full of energy and zeal, were next to enter the scene and succeeded in throwing out the Portuguese very soon. Helped by a laissez-faire policy and a self-stipulated dictum of at least a 100% profit, Cochin saw a great resurgence of trade. But the Dutch never endured too, and it was the British who came in next to play out their role. A great milestone was the direct export of pepper to England in 1636 and once again, power flowed from pepper. For a hundred years and more, from 1795, Cochin received a gracious patronage of the British. They tried their best to develop the harbour at Cochin, the gateway of South India, but for long dismissed as a dream beyond the realm of hope for a rock-like barrier of sand blacked the approach to the port from the sea. No dredging proposition since the days of the Suez Canal project has aroused so much technical interest as the opening up of the Cochin Harbor. It fell to the lot of an Admiralty Engineer Sir Robert Bristow to envision this marvel of engineering. It was not an easy task for Bristow to construct a port in these serendipitous surroundings. Cochin was declared a major port in 1936. With its opening, there was a complete reorientation of shipping and commercial activities on the Malabar Coast. With its year-round shipping facilities, it is the busiest port south of Bombay, lying as it does on the direct route to Australia and the Far East from Europe and serving the vast southern hinterland of industrial areas and plantations. It is a passenger port for the United Kingdom and America in South India. Moreover, it is one of the few ports of the world with all the three main forms of transportland, sea, and air, centered in the same place. Fort Cochin, with its European heritage, its air of genteel decay, and stubborn self-absorption is a place where history, like a friendly phantom, still stalks the lonely streets. The European have left random imprints in Fort Cochin. The massive buttresses, which are so conspicuous a feature of the place, were put up by the British to protect the houses that had been shaken by the force of an explosion that blew up the cathedral of Santa Cruz. In fact, they themselves had bombarded the church fearing a possible restoration of Dutch supremacy in Cochin. In spite of it all, the Santa Cruz Basilica still stands in a spirit of sturdy resistance. The chief landmark though is St. Francis Church, built in the early 16th century. It is the pride of Fort Cochin. The most magnificent pageant enacted here was the burial of Vasco da Gama in 1526. Nevertheless, it was to be a temporary resting place for this armed interloper, as after sixteen years later, his son Pedro da Silva Gama took away the mortal remains of his father back to Portugal. St. Francis Church is the oldest existing European church in India. From this choir, for the first time in India, resounded the sonorous chants of Rome. 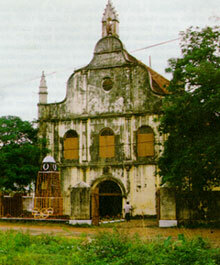 The church began life as a wooden structure built by the five friars who accompanied the Portuguese to Cochin in 1503. The Franciscans, followers of St. Francis Xavier who visited Cochin in the early 16th century, raised the present edifice. The most enduring impression of Fort Cochin is the enigma of the Chinese fishing nets. Like totems from another age stranded in time, they perch along the backwaters. Curious clumsy things with no bright counterfeit graces. The Chinese fishing nets are the most efficient means of backwater fishing and Font Cochin is full of them. The Dutch palace at Mattancherry was actually built by the Portuguese and presented to the Cochin ruler Vira Kerala Varma in 1555 as an act of expiation for the plunder and desecration of a temple near the Rajas palace by a hot-headed young Portuguese officer. The extensions of the east and south and the wooden ceilings of the Coronation Hall were incorporated by the Dutch and hence the name. The real glory of the palace however lies in its wall murals, all done using the tempera process of painting. Forty-five scenes from the Ramayana adorn the long walls of the bedchamber. They are known for their brilliant execution. Of the paintings elsewhere in the palace, one is a large unfinished portrait of Lord Vishnu. Mattancherry has a predominantly Muslim population. But tucked away behind its tumult is Jew Town, a quiet cul-de-sac. A single street of old discolored buildingsQuaint houses of solid buildwhere the few surviving members of the oldest Jewish settlement in India live. Hounded out of Muziris by the Portuguese, they came to Cochin in the 16th century and found an unexpected benefactor in the Raja of Cochin who allotted them this land near his palace and helped them build their place of worship. The Paradeshi Synagogue was built in 1568 with timber supplied gratis by the Raja who is said to have personally instructed the masons to mix mortar with coconut water for strong walls. One of the oldest synagogues in the world, it is a jewel of incomparable beauty with its brass columns, Belgian hanging lamps, and exquisite hand-painted, blue-and-white Chinese porcelain tiles of which no two are alike. The Parishath Thampuram Museum in Ernakulam has a large collection of 19th-century oil paintings, old coins, sculptures, Mughal paintings, and temple models. Vypeen and Gundu islands boasts of a lighthouse at Ochanthuruth, good beaches, and the 16th-century Pallipuram Fort. Thripunithura, 12 km southwest, has a Hill Palace Museum housing the collections of the Cochin and Travancore royal families. It is open Tuesday to Sunday from 9 a.m. to 12.30 p.m. and 2 to 4 p.m.
Edapally, 10 km northeast of Ernakulam, has the Museum of Kerala History. It is open Tuesday to Sunday 10 a.m. to 12 p.m. and 2 to 4 p.m.
Parur, 35 km north of Cochin, encapsulates the cultural and religious medley of this region. There is a synagogue, place of Brahmins, a Syrian Orthodox Church, a Krishna Temple, and a temple of goddess Mookambic. Four kilometers away is Chennamangalam that houses the oldest synagogue in Kerala. There is also a Jesuit Church and ruins of a Jesuit College. One can also walk to the Hindu Temple overlooking river Periyar, a 16th-century mosque, as well as burial grounds. The deity of Shiva temple situated at the heart of Cochin is popularly known as Ernakulathappan. The annual festival is an eight-day event, and on all these days, Seeveli procession with nine tuskers and Panchavadyam are held. On the seventh evening, Pakalpooram is conducted. Kathakali, Ottanthullal, music concerts are presented by renowned artists. The festival concludes with the Arattu. The Valanjambalam Devi Temple located in the heart of Ernakulam celebrates an annual festival for two days known as Thalapoli Utsavam. The procession with five caparisoned elephants accompanied by temple musical ensembles known as Ezhunnallippu takes place on both days. There are a lot of handicraft and antique emporia around MG Road, Ernakulam. One can also buy and see the works of contemporary artists from different art galleries situated around the city. Ernakulam / Cochin railway stations are connected to all metros. 2 days drive from Bombay.